Ginger will be two years old next week. She is my first jack and this was our first year racing. She has been a peach and very easy to deal with. I was blessed with a dog and not your normal jack Russell. Thank you for the information. When I get back to America this May, I will see what I can find for racing and agility competions for Ginger. 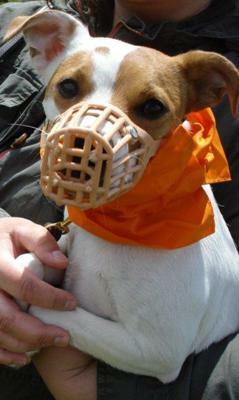 Have a wonderful day and I bet it won't be long before we'll be looking to get another JRT (male) for our Ginger's! I do not know how I got into JRT racing. I was raised with horses, race horses on top of it. And all horse people have jacks. After watching the local point to points and seeing the JRT racing, I wanted one. A friend of a co-worked stopped by right before christmas with Jack puppies and I had to have one. That spring we had a horse running at a point to point and I stuck Ginger in a race. She enjoyed it and we were from there. Yes, here is PA there is a local terrier trial help once a month. Hunderds of Jacks turn out for a weekend of fun. I too have a lovely girl named Ginger(BEAR). She looks a lot like your Ginger. She is my first JRT too and I am so delighted. I am an American NATO wife and we bought Ginger about 2 hours away, 2years ago. She is the smartest dog I have ever owned. I also have a Rat Terrier named JoyJoy that lives with my Mom and Dad in Texas. They had a small female chow that was "25" years old and she had died the year before we came here. My parents thought they would never want another dog. I stayed with them for about 5 months while my husband was in Iraq and my Mom fell in love with JoyJoy, so... after many tears and prayers I gave her to them and they are all so HAPPY! So, how did you get into racing your girl? Do you have groups in Pennsylvania? I will be back to America(Washington State) in May and we retire from there after a year. I would love to train my Ginger to race. She is wonderful at agility training. Thanks for sharing your Ginger and GOD bless and keep you both. Have a great day in PA!